I was a late bloomer into the world of winter squash and pumpkin. My mother never cooked with them when we were growing up, but as I started experimenting in the kitchen I quickly fell in love with these classic autumn super stars. The squash has also conquered Hubby’s heart. Once a vegetable he refused to eat and claimed he didn’t like, now one of his favourites; story sound familiar? The other day, as we sat at the dinner table enjoying some oven roasted kabocha, he actually said, and I quote “I can’t believe I was ever stupid enough to not eat this stuff”, and he was dead serious. It’s a full on love affair. 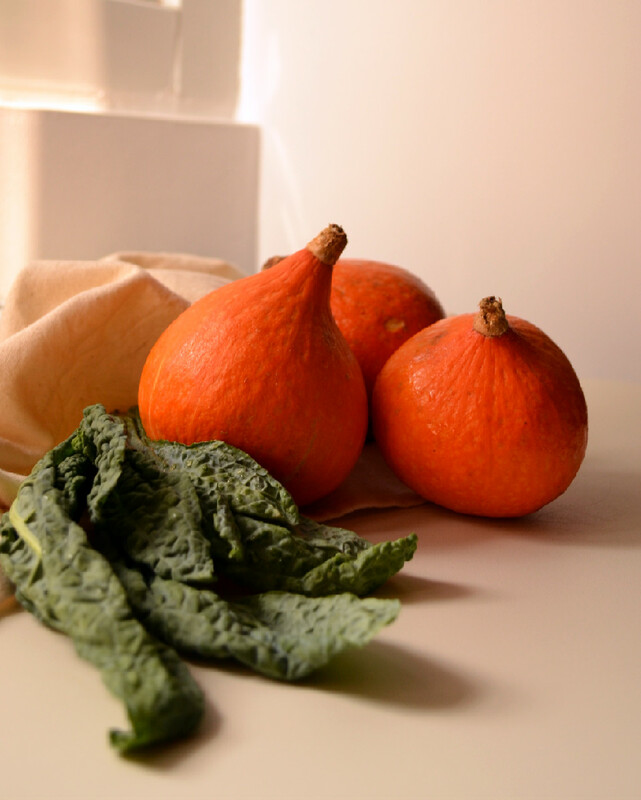 While Kabocha is our favourite winter squash, this post is all about the Hokkaido. 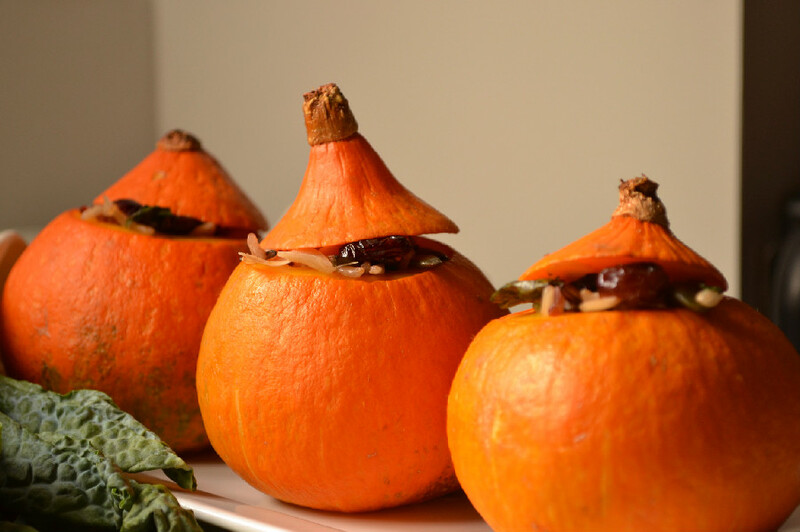 This pumpkin or squash variety (I’ve seen it referred to as both), also known as Red Kuri (or Potimarron en français), has a hard outer skin and a firm flesh and it resembles a pumpkin but without the ridges. 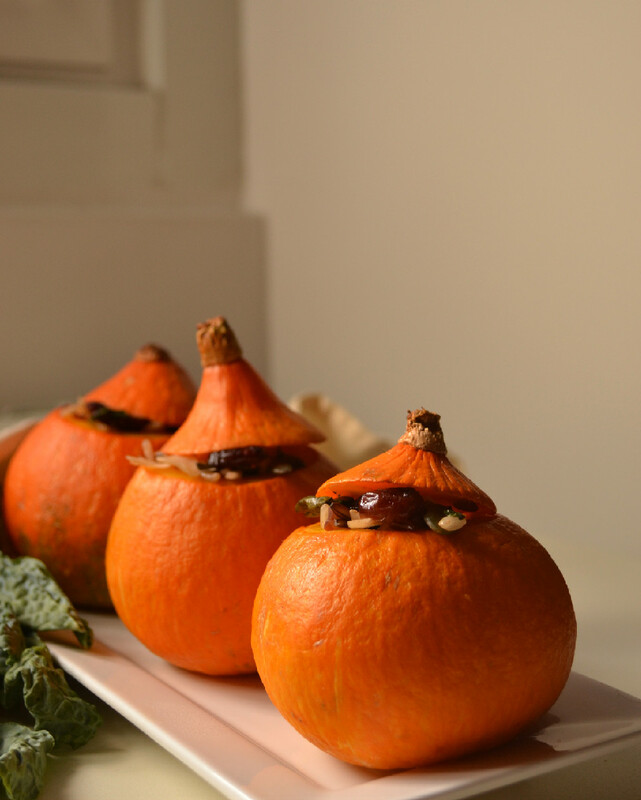 The flavour is delicate, the skin is edible and the cavity is quite seedy, making it the perfect pumpkin/squash for stuffing, especially when you can find this cute little single serving size. As soon as I saw these I knew they had to be stuffed, and in light of holiday season kicking off this weekend with Canadian Thanksgiving, I thought I’d share this Stuffed Hokkaido Squash recipe for the non meat/turkey eaters at the table. Whether you or your guests are vegetarian, vegan, plant-based or omnivore, this is an impressive addition to your holiday meal round up. The stuffing is made from a brown, red and wild rice mix, kale, cranberries, toasted slivered almonds and toasted pumpkin seeds. It’s loaded with fiber, vegetable protein and all the other goodness that comes from whole grains, nuts, seeds, dark leafy greens and squash. Slice the tops off the squash using a sharp knife, and reserve for later use. Use a spoon to scoop out the seeds and prepare the cavity for stuffing. Brush the inside with a bit of EVOO or Vegetable Broth. 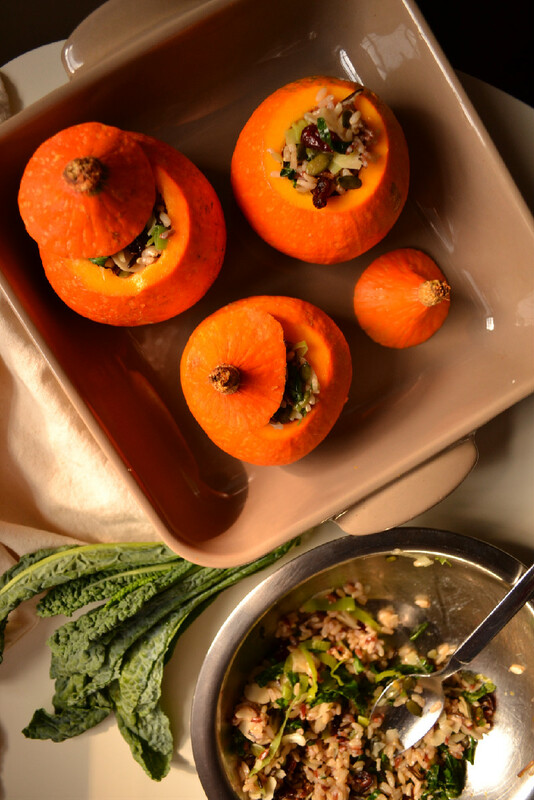 Place prepared squash in a baking dish with a few inches of water and set aside. In a wok or pan, heat EVOO, water or vegetable broth and saute onions with a pinch of salt, until transluscent. Add garlic and saute for 2 minutes. Add cranberries and thyme and saute for 2-3 minutes, then add chopped kale and saute until slightly wilted. Add toasted almonds and pumpkin seeds and toss to combine. Remove from heat and transfer to a mixing bowl. Add cooked rice mix and toss to combine well. Stuff the prepared squash/pumpkin with as much of the rice mix as you can fit inside and drizzle with a bit of EVOO or Vegetable broth, cover with the reserved tops. Cover baking dish with aluminum foil and bake for about 1 hour and 20 minutes or until the squash/pumpkin is fully cooked. This may vary depending on the size and variety of the squash/pumpkin you use. If you can’t find small 8-ball pumpkin or squash, the filling is enough to stuff a small 6 inch pumpkin/squash or both cavities of a medium sized butternut squash. If you have stuffing leftover, just heat it up in the oven, in a covered baking dish so it doesn’t dry out, and serve it as a side dish with a drizzle of extra virgin olive oil or Vegetable broth.